You are at:Home»Women in STEM»This is what a scientist looks like. This is what a scientist looks like. Casey B. Butler earned her B.S. and M.S. in Marine Biology from Florida Tech in 2003 and 2011, respectively. She is currently a biologist for Florida Fish and Wildlife. Tell us a little bit about yourself? What are you passionate about? I’m a spiny lobster biologist working for Florida Fish and Wildlife. My team is currently trying to understand more about spiny lobster ecology with respect to various aspects of the fishery. 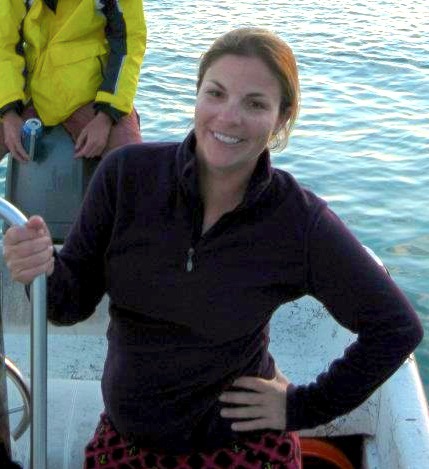 I split my time between working in the field (making observations on boats and underwater), in the laboratory (running experiments regarding biology and behavior), and at my desk (writing manuscripts, grant proposals, and making outreach materials like videos and web material). Science is awesome. The whole process of forming questions based on some observation, testing hypotheses, and developing new understandings based on the outcomes, is very rewarding. For me, one of the most exciting components of research is actually sharing the research, both with a scientific audience and with the general public. As a part of my graduate experience at Florida Tech, I had the opportunity to develop my science communication skills. This experience also showed me how important it is to share research with a wider audience. I grew up in Cocoa Beach and have always been fascinated by the ocean. I would often shake the seaweed on the beach over buckets and was intrigued by all of the life that found refuge in the Sargassum. I watched ghost crabs scurry along the beach, and noticed how patterns of the tides and seasons played roles in the suite of organisms that appeared along the shore. I also had the opportunity to observe sea turtles nesting, and watched as the little hatchlings raced seaward toward their journey. These experiences sparked my desire to become a marine biologist, and it helped that I also loved my math and science courses. I think it’s often difficult to stand out as a female scientist. While male scientists can make names for themselves with their “confidence” and strong ideas, women of a similar mold often are described in a negative light. However, I think this can be overcome when the science speaks for itself. You do great work, and you will eventually receive the respect you deserve. Another obstacle women face is having a family life while pursuing a successful career as a scientist. I think this is becoming less difficult for women in science, and may even be easier for women in STEM than in other fields. If you time it right, you can start a family while you are writing your dissertation or during the early part of your career. When I was little I never thought women could be top scientists and doctors. I mean, I was told “you can be whatever you want to be,” but I never pictured women in lab coats, just men. If I could, I’d go back and plug that idea into my head, and show myself and others all the brilliant women who have paved the way for women in STEM. It’s amazing what can happen when you change your mental image of what it means to be a scientist—we don’t all wear lab coats, some of us wear bathing suits and dive gear. Stay in tune with your dreams, and then work your tail off to make them come true. Surprisingly, at least in the field of marine science, there are now more women than men. Men are becoming the minority in our field, and this may actually be making it more difficult for women to earn positions when the field is hiring men to achieve diversity. Paint a new picture of what a scientist looks like; change out the old men in lab coats for women of all ages as engineers, ecologists, and doctors. Make young women aware of all the successful women already in the field.